scov1984 wrote: Underneath the dashboard near to the glovebox, in the corner.... right underneath.... there is an extra 12v socket. I did not know that until recently. My 2015 LCI doesn't have this. Do you have a small driver's side storage compartment? Around that time there was an option called extended storage, and as I recall included the driver side storage compartment, the two useless rear door pockets, a boot net and an additional 12v socket. FWIW I have it on my '14 model which has the central access into the boot but no nets. I don't recall any "useless" rear door pockets - not something I've noticed. Not something that's of much use but interesting anyway, I have a towbar mounted bike rack on mine, with the electrics connected the coast function doesn't work in eco pro. I thought mine was broken until I tested it again in normal mode without the bike rack. Just popped out to the car after it's been sat in the sun all day, nuclear hot inside, got in to start it up and put the A/C on and closed the door behind me. I went back inside and thought I wonder if I can lock it while it's warming up (cooling down the cabin) and it just so happens you can! That's bloody handy! Does the horn not sound on the 135 to notify you engine is running when you lock? 66 plate M140i horn sounds, can confirm! Interesting- I have the same age and model car, but mine doesn't sound the horn when locked with the engine running. Certainly did it enough times last winter so I think I'd have noticed! 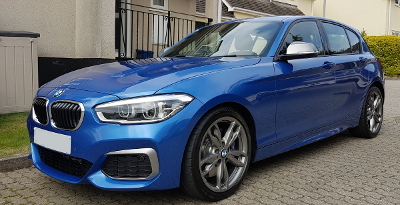 Another update from the m135i to m140i then. Presume it's for security reasons, but with the 6 cylinder rumble its impossible to not realise it's running when you get out/lock it! This is something I want to find out, not that I have found out yet! Recently when I get in the car, the car shown on the black panel display has an orange outline to it. Is this to tell me it’s hot inside or something? My guess would be a check control notification or service due? Either that or lights on!